Austin garden writer, blogger, photographer, and designer, Pam Penick made a brief visit to my prairie when she was in town this past weekend to attend the great State Fair of Texas with her family. 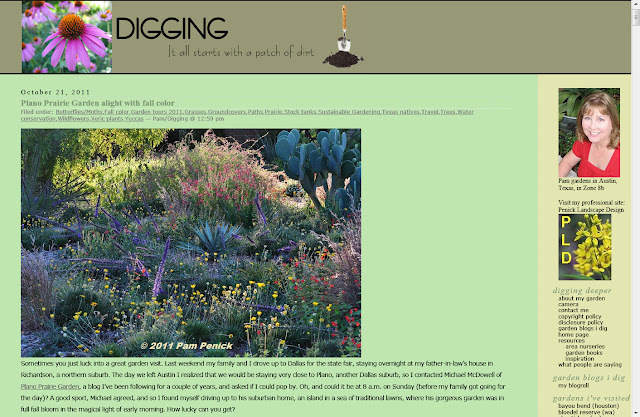 Click the link to see Pam’s perspective of my prairie on her blog, DIGGING. Her photos are great! I need to learn how to take photos like that. The only bad photo in the bunch is the last one of me. She is much better at taking pictures of plants or maybe it is the subject matter in this particular photo. Of course, my bad haircut from the day before did not help matters and she was knocking on my door at 8:00 AM on Sunday! Pam always has inspiring garden photos and stories on her blog. Until recently, she had a new post almost every day. She is not posting as often now because she is busy working on a book tentatively titled “Lawn Alternatives”. Search for her Lawn Alternatives page on facebook for more information and ideas. I can’t wait to read the book. I enjoyed the visit, Pam. It was a pleasure to meet you. Thanks for the squid agave pups too. If posting a screen shot of your blog infringes on your copyrights, let me know and I will take it down. October 16-22, 2011 is Texas Native Plant Week. In recognition, I compiled a list of the Texas Native Plant Winners, Losers, and Participants in my prairie for the Summer of 2011. This is a partial listing of some of the prominent plants in my prairie. These plants received supplemental watering no more than once every 7-10 days from mid-July through September. Outside of this period, the only watering came from the sky. The Winners - These are the plants that took the heat and drought with stride and showed minimal, if any, signs of stress. Aloysia gratissima – Beebrush -- Covered in blooms after rain or watering. Bee magnet. Amorpha fruticosa – False Indigo -- A couple of small dead limbs. Anisacanthus quadrifidus v. Wrightii – Flame Acanthus -- Reliable food for hummingbirds. Chilopsis linearis – Desert Willow - One tree split. Cut to the ground. New sprouts are 8 ft tall. Conoclinium greggii – Blue Mistflower - Delayed fall flowers due to drought. Dyschoriste linearis – Snake Herb -- Transplanted to the "hell strip" in June with ease. Liatris mucronata – Gayfeather -- Looked great all summer, even without flowers. Opuntia sp. – Spineless Prickly Pear -- Not sure of the exact variety. Phyla nodiflora - Frogfruit -- Blooms all summer with a little water. Polanisia dodecandra – Clammyweed -- Blooms all summer with no attention. Salvia azurea – Pitcher Sage -- Bloomed in spring and late summer this year. Salvia farinacea – Mealycup Sage -- Cut to the ground in July for regrowth in fall. Salvia greggii – Autumn Sage -- A couple of plants in difficult locations died. Schizachyrium scoparium – Little Bluestem -- A couple of plants may be dead. Plants are shorter this year. Verbesina virginica – Frostweed -- A little shorter this year. Covered in flowers and butterflies now. Yucca pallida - Pale-Leaf Yucca - Has several pups this year. Zanthoxylum clava-herculis – Hercules’ Club -- Tough tree with glossy leaves and thorns. Zanthoxylum hirsutum – Toothache Tree -- Same as Hercules' Club but more compact. Zinnia grandiflora – Yellow Zinnia -- Short ground cover covered with yellow flowers all summer. The Losers - These are the plants that experienced the most damage from the heat and drought. Ribes aureum – Buffalo Currant -- Main plant died. A couple of suckers are still green. Rudbeckia fulgida – Black-eyed Susan -- Plants wilted badly and large patches died. Sambucus nigra ssp. Canadensis – Common Elderberry -- All top growth died. Resprouting from roots. Likes moister conditions. The Participants - These are the plants that survived the summer by going dormant. They are unattractive winners. Agastache sp. – Hummingbird Mint -- Stayed green all summer, but no flowers until now. This variety is probably not a TX native. NM maybe. Callicarpa americana – American Beautyberry -- Would prefer more shade. Wilts badly when dry. Cephalanthus occidentalis – Buttonbush -- Normally grows by water. Leaves on lower half of plant turned brown. Salvia pentstemonoides – Big Red Sage -- Brown leaves on lower half of plant. Needs to be divided. Sorghastrum nutans – Indian Grass -- Turned yellow green. Only a few short flowers this year. Thoughtful plant selection and placement is important for any plant, including Texas natives. They also need careful watering in the first season or two to help them get established. For all of these reasons, my Winners and Participants lists are much longer than the Losers list. Even after a hot, dry summer, the resilience of Texas native plants is evident in this October 2011 photo. This may be the best fall flower display yet. My front yard prairie is full of flowers. It is amazing how many flowers there are considering the heat and drought we endured this summer. A wider view of the prairie shows the colorful flowers of Gayfeather, Mealycup Sage, Scarlet Sage, Four Nerve Daisy, Zexmenia and Pink Skullcap. All of these flowers provoked an invasion of winged insects. At the end of this post is a list of plants that you should not plant if you do not want a similar invasion. The invaders: butterflies. For the last couple of weeks, my prairie has been filled with butterflies, especially Monarchs. I counted about 25 in the front prairie today. I am sure there were several more in the back prairie while I was counting. They fly from flower to flower drinking nectar from plants like Frostweed. This Monarch is feasting on the nectar of Gregg's Mistflower. Several of the Monarchs paired off with plans of laying eggs to create more butterflies. Caterpillars will hatch from those eggs and eat all of the leaves on my milkweed. I have not seen Monarch caterpillars yet, but I did find notice my pipevine was being consumed by Pipevine Swallowtail caterpillars. Monarchs are not the only butterflies to invade the prairie. Closely related Queen butterflies have a taste for Gregg's Mistflower as well. A Common Buckeye sips nectar from Gayfeather. Another Common Buckeye with some wing damage is on the Gregg's Mistflower. This Skipper is drinking from Gayfeather. This Painted Lady butterfly is feeding among the flowers of Mealycup Sage. American Lady is closely related to Painted Lady. American Lady has fewer and larger eye spots on the wings than Painted Lady. This little Eastern Tailed Blue is resting on Pink Skullcap. I caught this Common Checkered Skipper laying eggs on a Winecup that rabbits had already nibbled. This Purple Aster just started blooming. The Willowleaf aster and Fragrant Mistflower will begin blooming in another day or two. They will surely be covered in butterflies as well. Below is a list of plants to avoid if you don't want butterflies flying around your garden, drinking nectar from your flowers, and laying eggs on your plants. If you just stick with grass and spray pesticides, the butterflies will fly right past your yard. Here is an interesting video about Monarchs that aired in 2010.